Mad Hatter Hintergrund - If I Am Not Mad. I made this myself, and I don't think it turned out too badly. Please be nice to it. It is the first desktop I have ever gepostet online. Let me know what Du think. :). 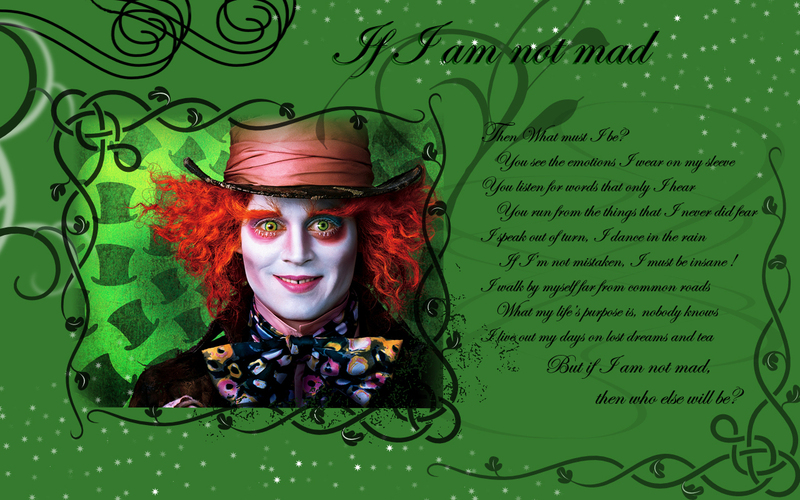 HD Wallpaper and background images in the Alice im Wunderland (2010) club tagged: alice in wonderland wallpaper movie madness johnny depp tim burton alice mad hatter. totally awesome! I can totally relate! carolkc you can't put it in your tea room. it's already in mine! just kidding, but i do love it. IF I AM NOT MAD THENWHAT MUST I BE? YOU SEE THE EMOTIOMS I WEAR ON MY SLEEVE YOU LISTEN FOR WORDS THAT ONLY I HEAR YOU RUN FROM THE THINGS I NEVER DID FEAR I SPEAK OUT OF TURN I DAMCE IN THE RAIN IF IM NOT MISTAKEN I MUST B IMSANE! I WALK BY MYSELF FAR FROM COMMON ROADS WHAT MY LIFES PURPOUS IS NOBODY KNOWS I LIVE OUT MY DAUS ON LOST DREAMS AND TEA IF I AM NOT MAD THEN WHO ELSE WILL I BE? ?